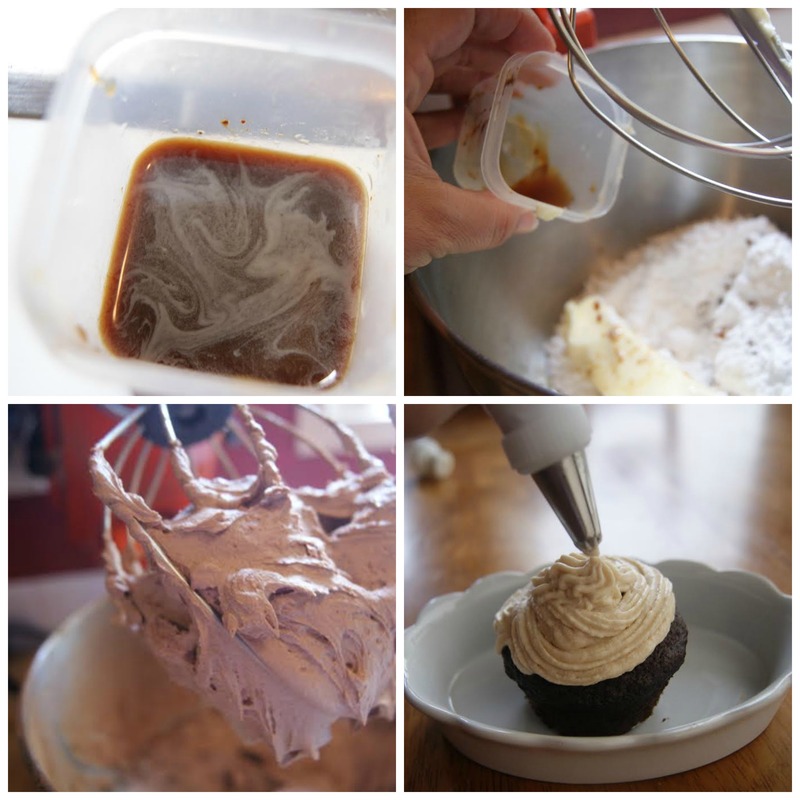 This Coffee Buttercream Frosting Recipe is amazingly delicious and more than a little addicting. A perfect creamy filling and icing for layered cakes or to top your favorite cupcake recipe. Spread a thin layer on brownies or scoop some between a couple of chocolate chip cookies. 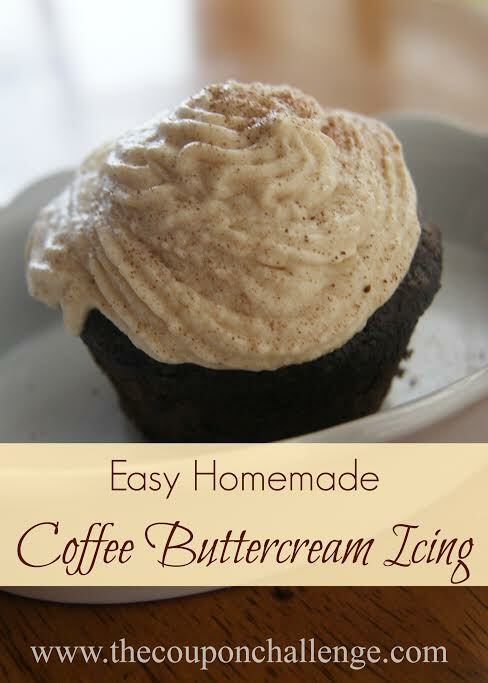 If you are a coffee lover like I am, this rich and tasty icing is a must have for your recipe arsenal. I love using it to top a dark chocolate cupcake or even carrot cake flavor. Homemade Buttercream Icing can take a box mix from so-so to over the top, the extra jolt of coffee flavor makes it doubly decadent. Substitute almond or hazelnut extract for vanilla for another layer of flavor. To pipe icing on using a decorator bag, thicken it by using more powdered sugar. * Icing Tip- to load bag roll it halfway down over a glass and fill, roll bag back up and press icing down from top with even pressure, start on the outside and work your way inward. In a large bowl cream butter until smooth, beat in powdered sugar on low speed until well combined. Stir in instant coffee, vanilla, half and half and whip until thoroughly mixed and fluffy on a medium-high setting. If you prefer a thicker icing add more powdered sugar, for a looser consistency add additional half and half. 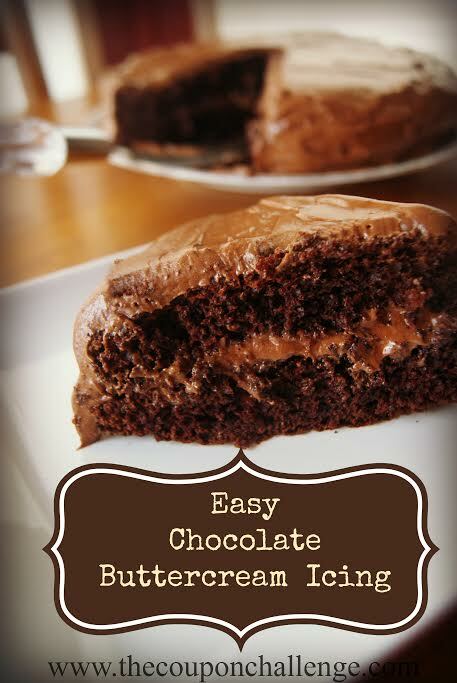 This Chocolate Buttercream icing recipe is simple and delicious – it should definitely be added to your recipe box for anytime you need a filling or frosting for your favorite cake or cupcakes. 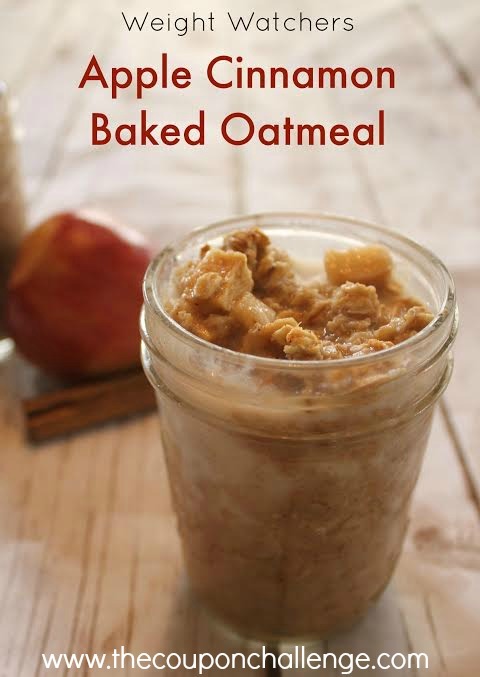 It’s a simple sweet and creamy mixture that makes even box cake mixes special. I use this to fill a layered Devil’s food cake as well as frost the entire thing. If you are going to be piping it on with a decorating bag simply add a bit more powdered sugar to make it thicker and it will hold its shape better. This is the type of icing that forms a light “crust” when it sits. Icing can be stored in airtight container in refrigerator for up to two weeks, just whip for a minute to loosen. 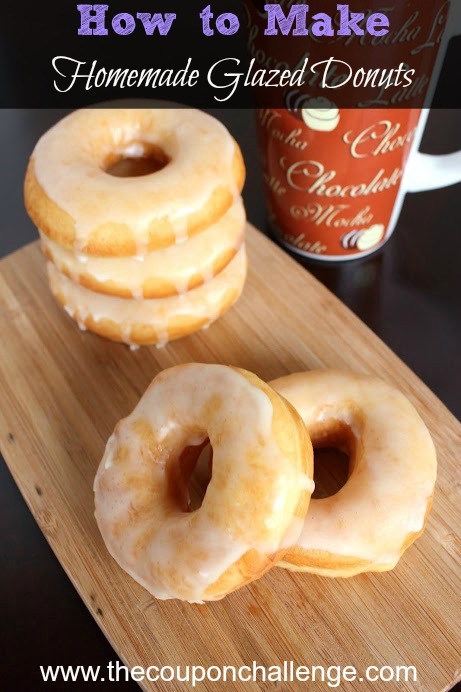 For tasty flavor variations use almond extract in place of vanilla. 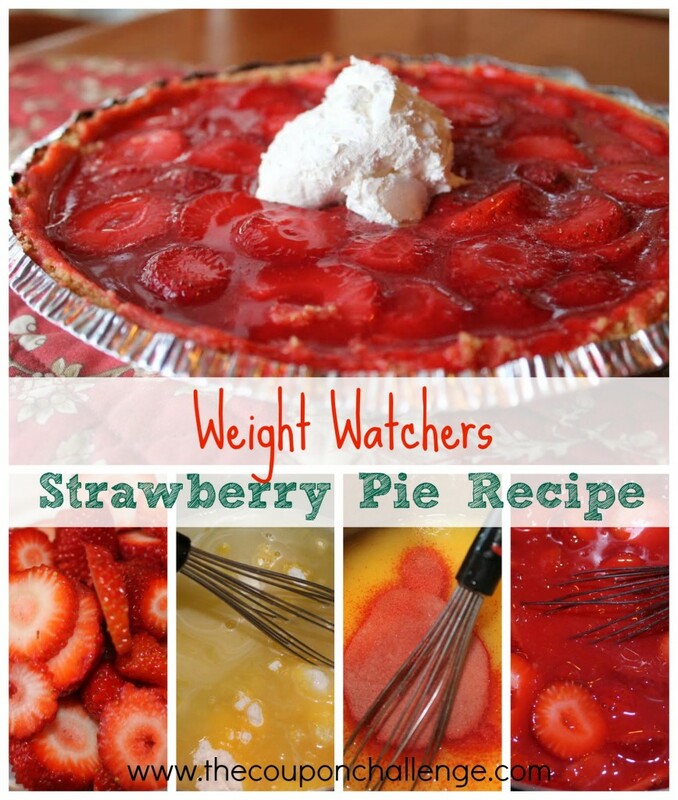 You can also use hazelnut or raspberry to create new and delicious flavors. Make sure you butter is softened but not melted, melted butter will ruin the consistency of this icing. Cream butter until smooth and slightly whipped. Add powdered sugar a cup at a time, on low until thoroughly incorporated. Mix in cocoa powder, half vanilla, and half and half. Continue to beat mixture until fluffy and smooth on a medium-high setting. Add more powdered sugar for a thicker consistency or more half and half to loosen the icing. 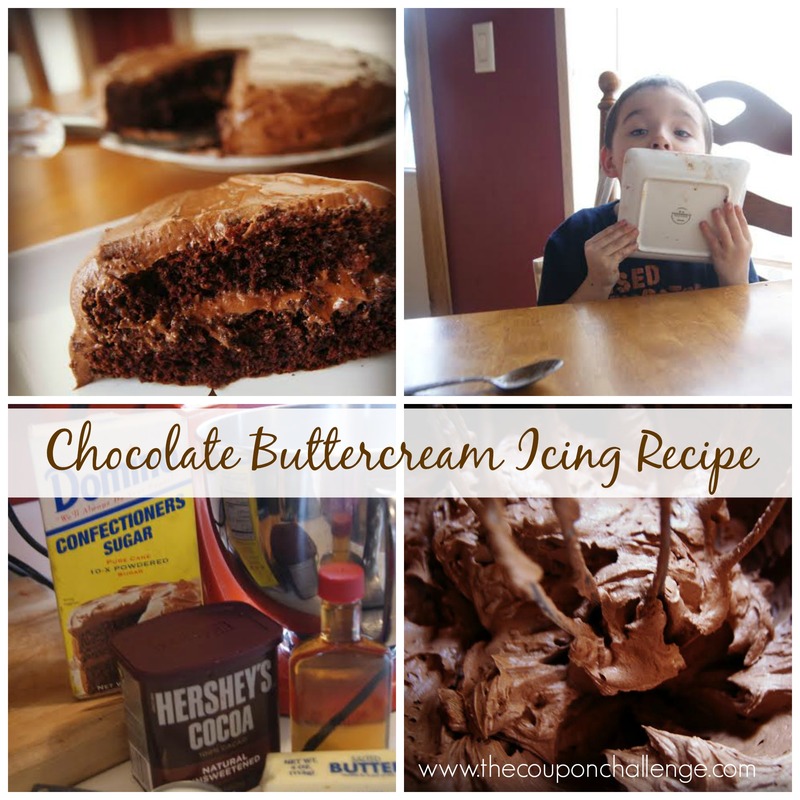 Share your thoughts on this Chocolate Buttercream Icing Recipe.